Happy (somewhat belated) 2014 everyone. Apologies for my blog silences over the past month, I’ve moved to self-hosting (more difficult and time consuming than I was expecting) and I took the opportunity to redesign. Plus of course there’s been the whirlwind of socialising with family and friends in the beautiful Cape Town sunshine. Let’s just say it’s been hectic, and so much fun. Now it’s time to get serious and I’m ready to jump right back into full blogging mode…with plenty of lovely restaurants, recipes and adventures to share with you. I thought I’d start with my favourite recipes from last year. It was interesting looking back to discover how the recipes I cooked were influenced by my travels. And of course the ingredients I was surrounded by at the time. These 10 dishes are all easy to make, taste amazing and have become firm favourites in our household. I hope they will be in yours too. Do try them out and let me know what you think. I love Spain and visit as often as I can. Cooking is a joy there, a quick visit to the market for the freshest (and cheapest) ingredients you can find and a bit of imaginative thinking. So you’ll see that a lot of my dishes have a Spanish influence. 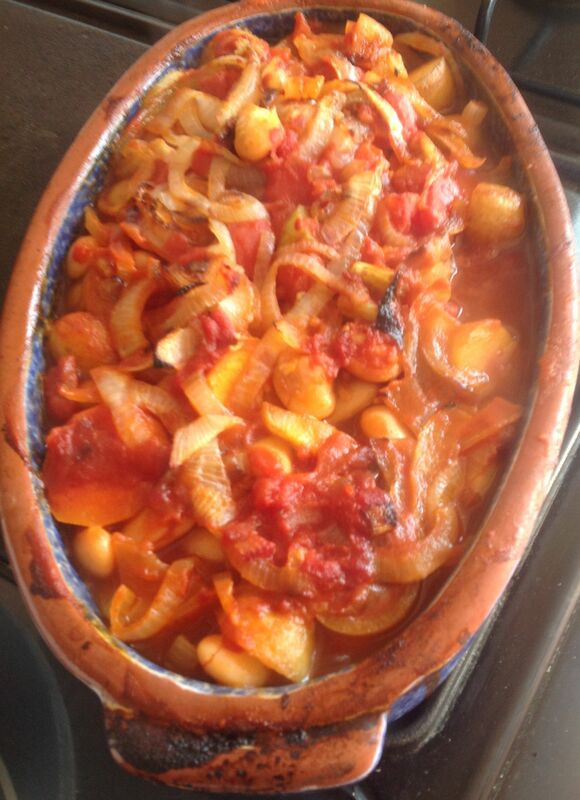 I came up with this stew while I was in London – the paprika, garlic, butter beans and tomatoes add a distinctly Spanish touch. Fry the sausages and onion in a little oil for about 15 mins on a medium/low heat until lightly browned. Place the sausages and onions in the bottom of a casserole dish. Add all the rest of the ingredients and pour over the stock. Cover the dish with foil and cook in the oven at 180C for about 60 minutes or until the potatoes are soft. Cooking with unusual ingredients is always a challenge. And it’s fun. So when the Chichester Biltong Company asked me to come up with some recipes cooking with that fabulous South African ingredient, biltong, I was only too happy to get creative. This soup was the clear winner in a range of (I think) inventive biltong recipes. Fry the chopped potato and onion in the olive oil in a deep pan for about 10 minutes until softened. Add the peas and the vegetable stock and bring to the boil. Add the chopped biltong and watercress and boil until the watercress has wilted. Add the fresh mint and the horseradish. Take off the heat and blend with a hand blender until the soup is thick and fairly smooth. To make the horseradish cream, mix together the double cream and horseradish. 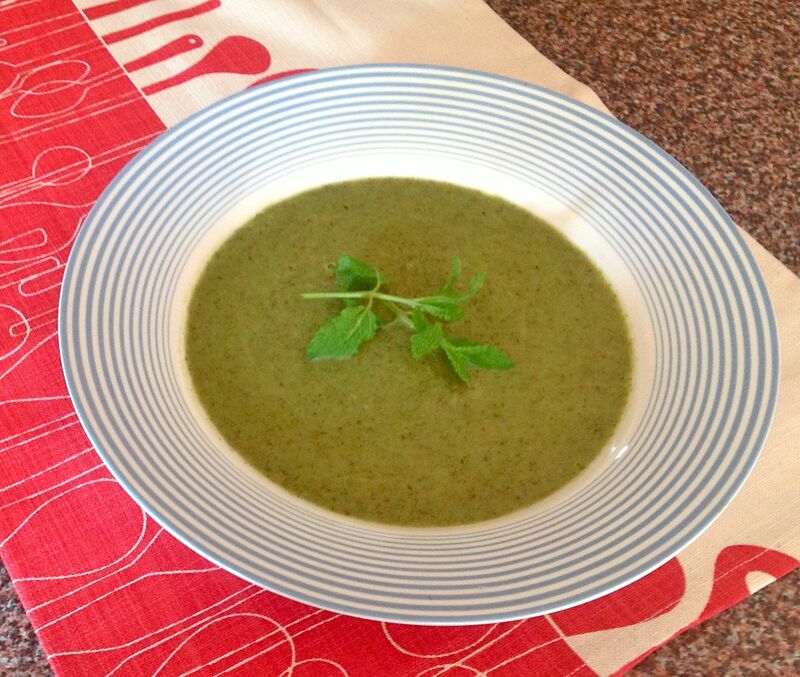 Serve the soup with a dollop of horseradish cream on top and a sprig of mint. Roasts are always a favourite in our household. 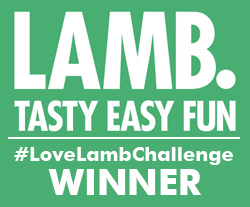 A Moroccan-style marinade lifted this leg of lamb to another level. Place the garlic cloves into a pestle with the salt and grind to a paste. Add the other spices. Mix together with the softened butter. 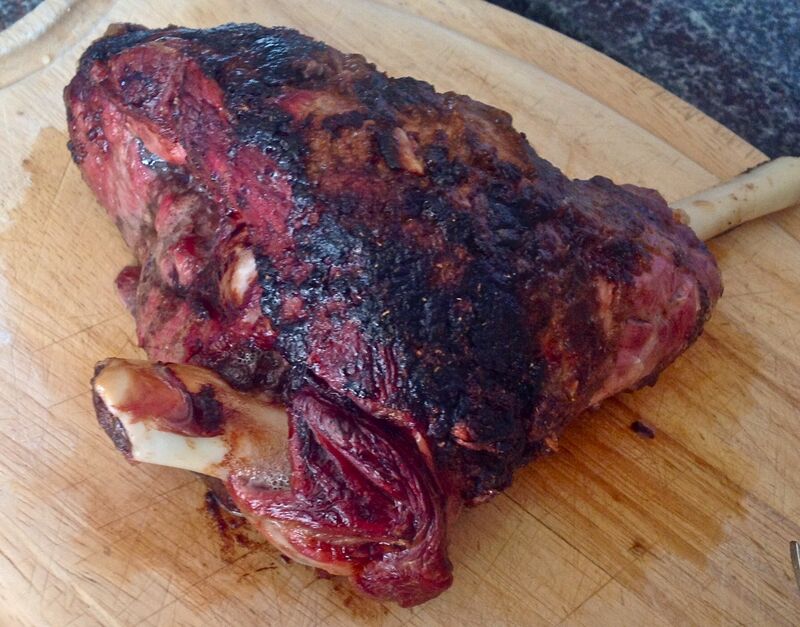 Make small slits all over the lamb, going quite deep into the meat so the flavours can infuse. Spread generously with the butter and leave for about 4 hours. Cook the meat at gas mark 8 (220C) for 30 mins and then turn it down to gas mark 5 (190C) for 30 mins per 450g. About two hours 40 minutes for this leg. For the last hour add chunks of onion and carrots into the dish with the lamb and roast in the juices. Pour over 2 handfuls of dried apricots and a handful of flaked almonds for the last 10 mins of cooking. Take the lamb out and rest for 10-15mins, covered with foil. Leave the vegetables to carry on cooking. Carve thinly and serve with roast or mashed potatoes and the vegetables. Nothing says summer like this salad – both in its appearance and taste. I love the beautiful greens combined with the pale pink of the prawns. 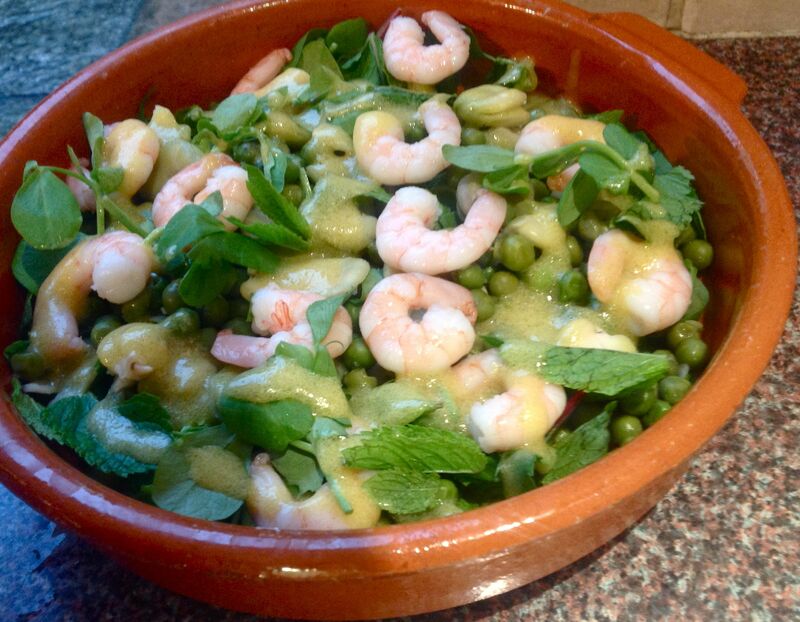 Once you’ve cooked and cooled the peas and broad beans, simply combine all the salad ingredients. Top with the prawns, pour over the dressing, toss and serve. Summer on a plate! Another Spanish-influenced dish, these meatballs make a hearty yet light dinner. To make the meatballs, combine the pork, grated onions, breadcrumbs and parsley in a bowl. Season with salt and pepper. Use your hands to mush all the ingredients together until they are thoroughly mixed. Wet your hands and shape into little balls about the size of an apricot. Cover with clingfilm and leave in the fridge to settle for about half an hour. To make the sauce, heat the olive oil in a pan. Add the garlic, onion and peppers and fry for about 15 minutes until the peppers are soft. Add the tomatoes and crumble the chilli into the mixture and bring to the boil. Reduce the heat to as low as possible and simmer lightly, uncovered for about 45 minutes until the sauce is slightly thickened. Make sure you stir it regularly to ensure it is not sticking. To fry the meatballs, add the olive oil to a frying pan and when it is hot, add the meatballs. Turn it down slightly so the meatballs aren’t frying too furiously. Cook until browned and then turn around until browned all over. Gently add the meatballs into the sauce, spoon the sauce over, cover and simmer lightly for 15 minutes. Add the peas and stir through gently. Simmer for about 10 minutes to heat through. Serve in bowls with chopped fresh parsley scattered over. Add crusty bread on the side to mop up all the juices. 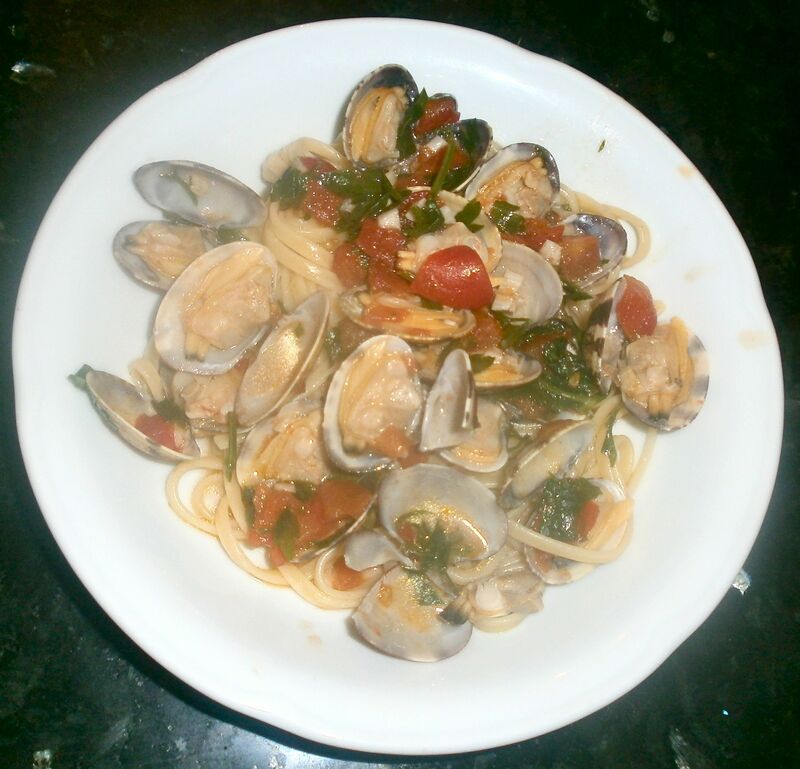 I love Vongole – another dish with very few ingredients that delights in its simplicity. Here’s my version, used making fabulous clams from the local market in Spain. Five minutes before it’s ready, add 2 tbsps of olive oil to a pan and add the chopped garlic. Crumble in the chilli and add the chopped tomatoes. Stir together for a couple of minutes. Add the clams and pour in the wine. Leave for about 4 minutes, shuffling the pan. When the clams open up your sauce is ready. Drain the pasta and add it to the clams. Add the chopped parsley and toss everything together. South East Asia is another inspiration. 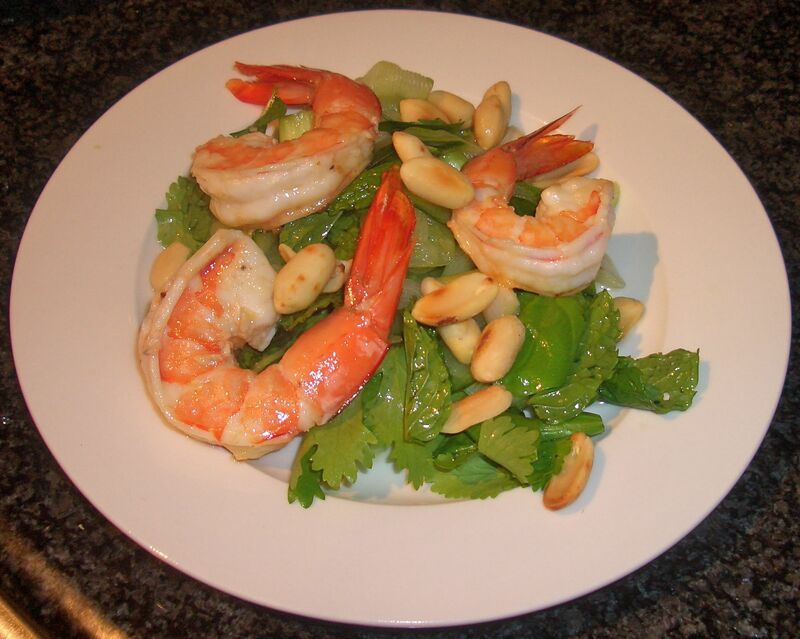 I love the freshness and zestiness of Thai and Vietnamese food and came up with this prawn dish for a starter when I had friends round for dinner. Totally amazing. Mix the marinade ingredients together. Pour three quarters of the mix over the prawns and leave to marinate for about an hour, stirring occasionally. Save the rest of the liquid to dress the salad. Mix all the salad ingredients together, pour over the remaining dressing and toss. Fry the prawns in a little olive oil in a hot pan for about 3 to 4 mins until they are nicely pink. Place on top of the salad. Sprinkle with the peanuts and serve. Another Thai-inspired dish – I’ve been to Thailand many times and love Thai food. 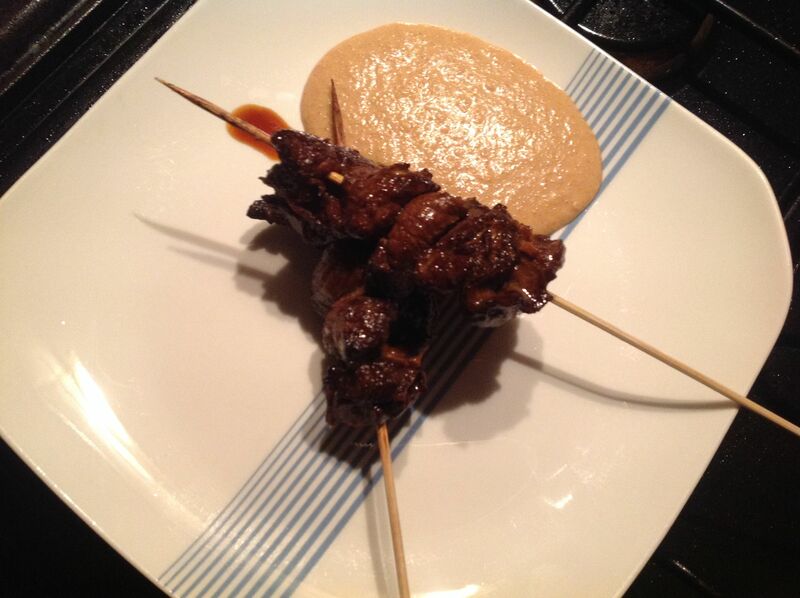 It was interesting making satay sauce as it comes in many guises. I was very pleased with the results. 500g rump steak, very thinly sliced. I ran a very sharp knife through the middle of the steak (lying flat on the board), to cut it into half before slicing it into strips. Mix all the marinade ingredients together and add the thinly sliced steak. Leave to marinate for at least two hours, overnight if you have time. Meanwhile, make the peanut sauce. This makes a good batch for two meals. We quickly fried prawns in chilli oil the next night and dipped them into the leftover sauce. Totally delicious. Place everything into a food mixer and blend until your sauce is completely smooth. Top tip: Make sure you use dry roasted peanuts they give the sauce a much deeper flavour. Thread the thin slices of beef in folds onto skewers. If you’re using wooden skewers, make sure to soak them in cold water in the sink for at least half an hour. Place under the grill for about 4 minutes on each side. They won’t take long as the steak is so finely sliced. Serve with a generous dollop of the peanut sauce on the side. 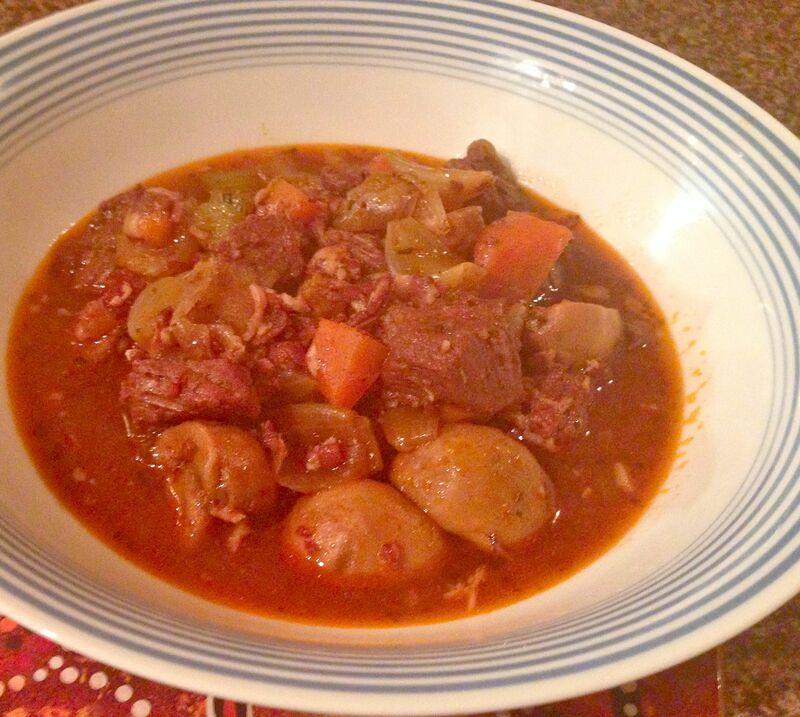 On a cold winter night, you can’t beat comfort food. This bowl of deliciousness is perfect to warm the cockles of your heart and your tummy. Heat the oil in a pan over medium heat and brown the beef. Set aside. Add the garlic, onions and bacon and fry until softened, about 10 mins. Add the mushrooms and fry for another 5 mins. Add the carrots and celery and fry for another 5 mins. Add the tomato paste and stir through. Pour in the wine and the water and stir through. Add the beef back in. Simmer on a low hob for 3-31/2 hours until the liquid is nicely reduced and the meat is tender. 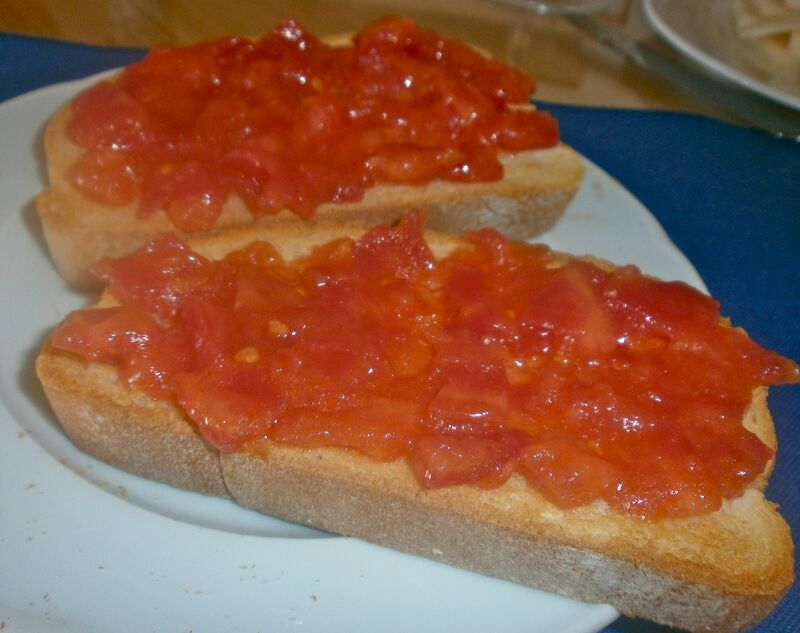 Yes, we’re back in Spain. This simple dish is one of my all-time favourites, simple, bursting with flavour and ideal eating as a snack, starter and especially for breakfast with a coffee and some sunshine. Peel the tomato by immersing in boiling water for about 2 mins and then removing the skin. Cut it up into small pieces and pour over the olive oil. Use the back of a wooden spoon to mush up the tomato a bit and leave to marinade for at least two hours, overnight is good. Cut the garlic clove in half and rub it over the warm toasted bread, make sure you cover the toast thoroughly. 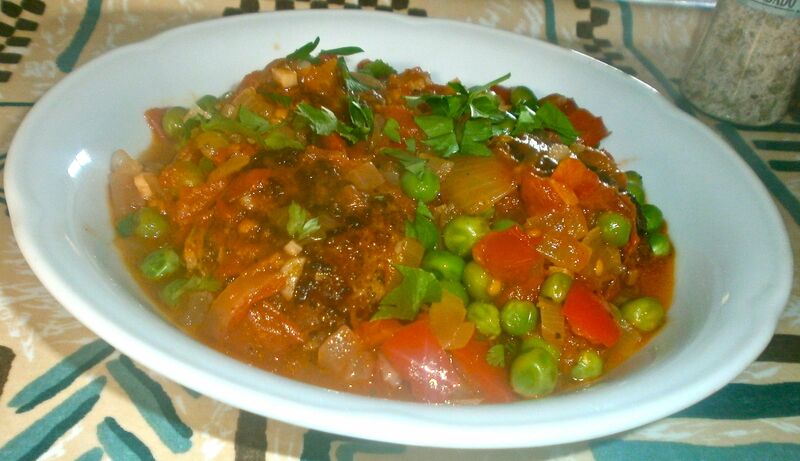 Top with the tomato topping and serve. What’s the best thing you cooked in 2013? I’d love to hear all about it.